1) Minor Winter Weather Event Tuesday AM: Areas of light wintry precipitation will be possible late tonight into Tuesday as a warm front lifts north through the region. Although quite scattered, best chances will be across western portions of the state. Not everyone gets in on the action but certainly something to keep in mind for your morning commute. 2) Rain Showers + Snow Melt Tuesday PM through Wednesday PM: Precipitation will change to all rain Tuesday afternoon and continue off and on into the overnight. Right now it looks like heaviest rains fall to our west. Parts of West Virginia, Kentucky, and western Maryland will see 1" to as much as 3" of rain on top of melting snow leading to flooding. This may become a bit of a concern here as well with heavier, steadier rains working in Wednesday afternoon. On the bright side, most areas hit 50 Wednesday before the frontal passage. Summary: For the Shenandoah Valley (taking everything into consideration)...I think there will be snow, but I'm not sold on much more than a few inches (1-3 or so). 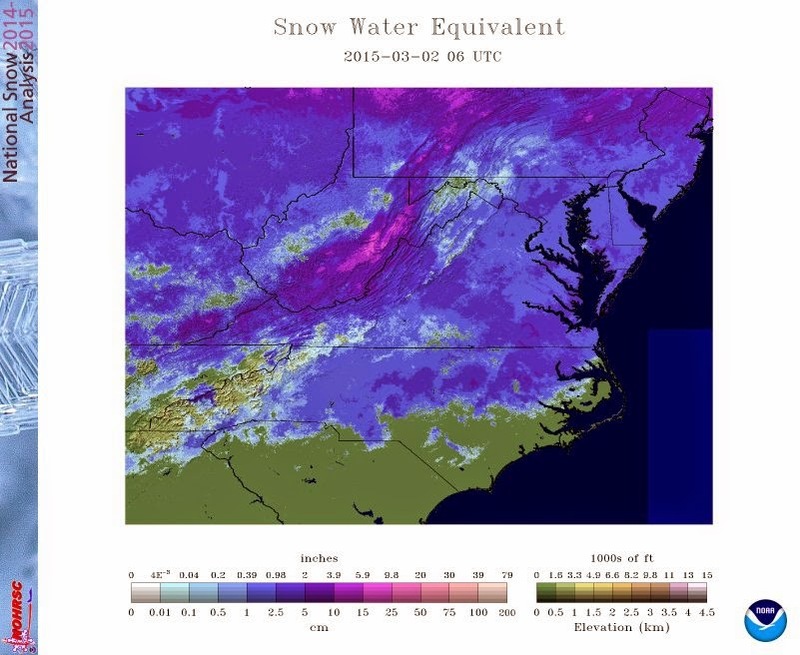 Higher amounts may be found across western mountain areas and the far northern Valley. This is a bit of a compromise between my brain (higher) and my gut (lower). Be sure to check back tomorrow as this is very subject to change.